I had never tried “sand dabs” before, but there they were on the extensive Bluewater Boathouse menu, and I was intrigued. “They’re small fish, and very delicate, and we offer them with a light lemon sauce and capers,” the waitress said. “They’re one of my favorite items on the menu.” Her smile was genuine, and I felt I could trust her; after all, she not only answered this question but several others posed by my dining companion. The sand dabs melted in my mouth, and I was pleased with my accompanying cheesy scalloped potatoes and fresh vegetables. The entrée was $16.95. My friend’s lemon pepper mahi-mahi ($24) featured a crunchy crust that was a nice counterpoint to the mild fish that easily fell into moist flakey bites; it was served atop scalloped potatoes and sautéed spinach with a chili cilantro sauce. By the time we finished, we were full, especially considering the fresh homemade bread and large house salads we began with. 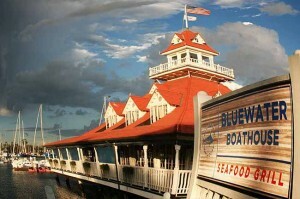 Bluewater Boathouse is the fourth restaurant I’m aware of to occupy the iconic building that was, a century ago, the boathouse for Hotel del Coronado. 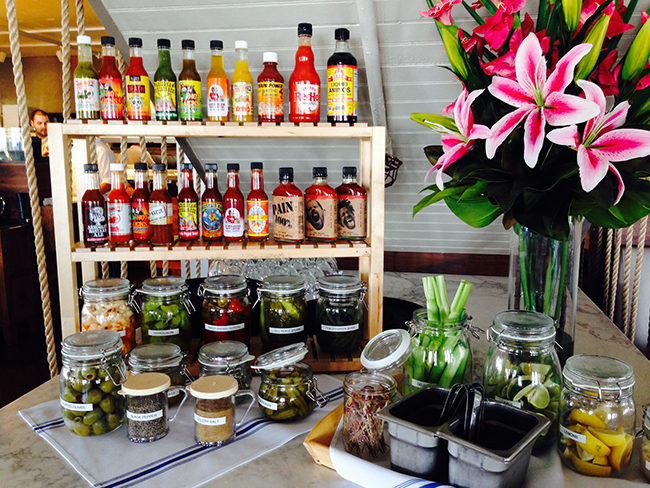 But what a sea change Bluewater Boathouse brings to the island. 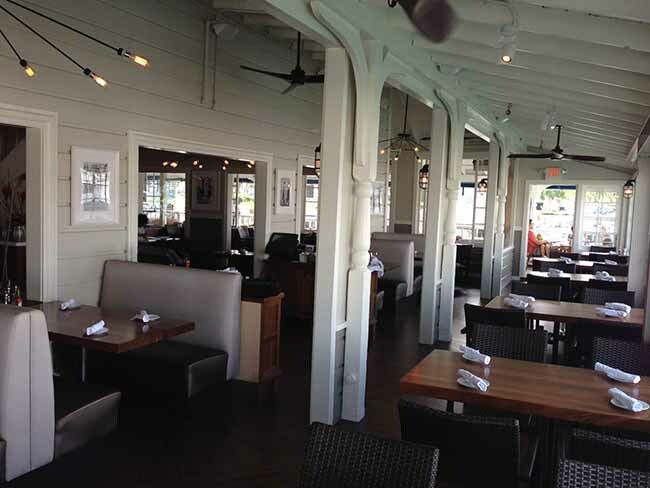 After opening the week before Coronado’s busiest weekend (Fourth of July), Bluewater Boathouse now has its sea legs and is cranking out some of the best seafood in San Diego County. New interiors feature wood-plank flooring, a light taupe pallet with crisp white trim; the effect is nautical, but not kitschy. It’s like stepping into a comfortable beach cottage. Once the home of the first Scripps Institute of Oceanography and later the site of the first Coronado Yacht Club, it just seems fitting that this over-the-water setting should be a seafood restaurant. 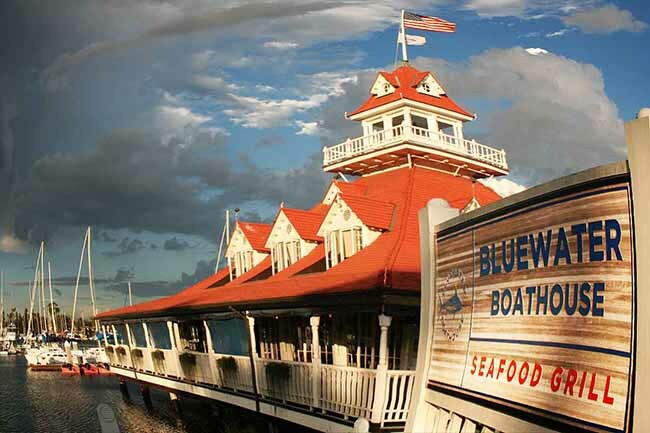 And make no mistake; Bluewater Boathouse is a seafood restaurant, offering up to 40 different selections of seafood and shellfish throughout the four seasons. 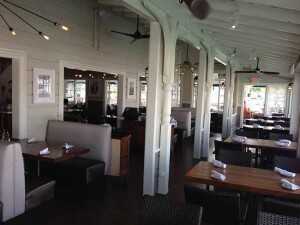 Bluewater Boathouse is the sixth location of the Bluewater family of restaurants and the first to open in San Diego County. The restaurant group was founded in 1996 by Jimmy Ulcickas and Rick Staunton with the opening of its first restaurant in Newport Beach’s Cannery Village. If you don’t see exactly what you want on Bluewater’s menu, ask your food server. 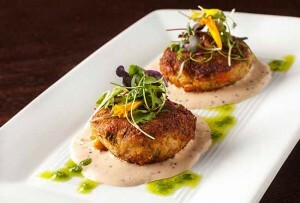 The chefs are adept and eager to prepare fish just the way you want it. 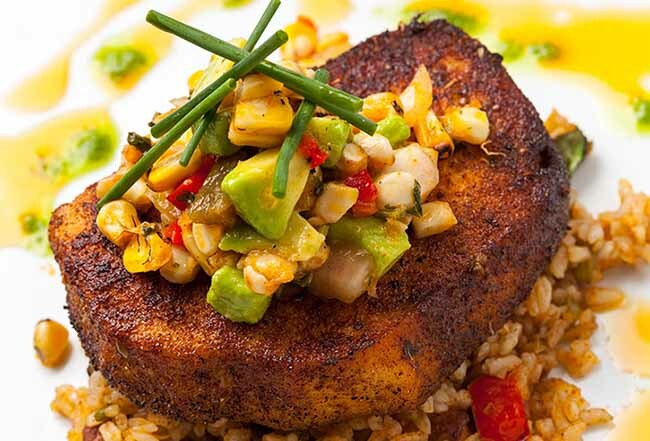 Baked, steamed, sautéed, blackened … yeah, they do that! Ulcickas and Staunton had been trolling the San Diego–Coronado area for nearly 10 years, looking for a desirable location. 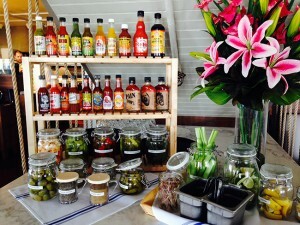 The right opportunity presented itself late last year when Marty Jensen, part owner and general manager of 1887 on the Bay, announced the restaurant was for sale. (Jensen, now retired, had also been the longtime general manager of the Chart House, which had a 30-year run on the site.) But Ulcickas said there was no way they could make a deal work for a lease that would only run 13 years, especially considering that the property would require substantial renovation. Although it has six, soon to be seven locations, Ulcickas points out several reasons his restaurants aren’t a chain. And he also believes in Coronado. “Great city, great people,” Ulcickas said, noting that all of the former restaurant’s employees who wanted to stay on were offered jobs, and 30 more staffers were hired, necessary to cover the expanded hours that now includes lunch daily. For dinner, Ulcickas said Bluewater is “not a $75 entree with $50 pairings” type of place. “It’s casual with friendly prices, friendly people and friendly surroundings.” If you hear the word “friendly” a lot from Ulcickas, know this: His stepfather started the Friendly’s Ice Cream Parlor restaurants and grew that company into (hate to say it, but, here goes…) a chain of 650 restaurants. Ulcickas said he is partial to Bluewater’s cioppino, and its chipotle blackened swordfish ($29.95). But on my next visit, I’m ordering the cedar plank salmon, ($27.50), cooked on specially selected planks to impart the most flavor. 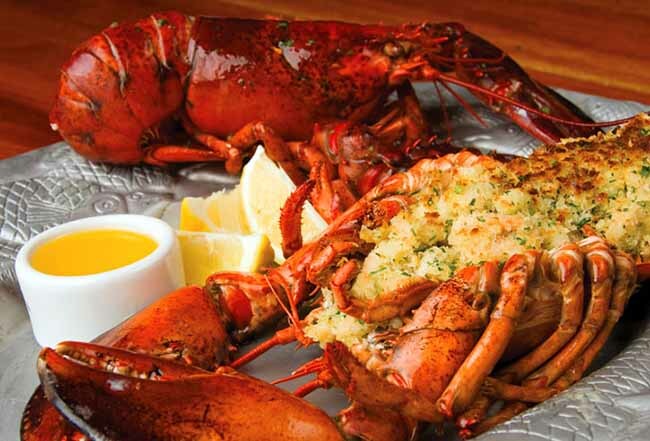 Or, here’s an idea: forget stuffing the bird, and head down to Bluewater for its holiday baked stuffed Maine lobster, available throughout November and December. Stuffed Maine lobster is a classic family feast that originated in Boston-area seafood restaurants and has since become a cherished New England holiday tradition. Order the lobster; a turkey will thank you. Open daily: 11: 30 a.m.–9:30 p.m. Happy hour, Sunday–Thursday, 3–6 p.m.